Robert Venditti – Writer, Graphic Novels, Comics, and more. 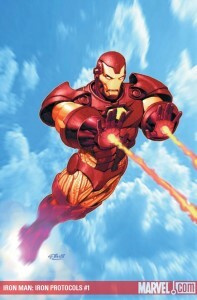 » Blog Archive » Iron Man: Iron Protocols in Stores! Iron Man: Iron Protocols in Stores! I have a 22-page story titled “The Ark” that appears in the Iron Man: Iron Protocols one-shot released today (with interior art by Nelson DeCastro and cover by Ariel Olivetti). I wrote the story over a hectic 3-week period in January of 2008, during which time I was offered the job, I pitched my idea, and I turned in the first draft of the script. I remember telling John Barber at Marvel that I would hit the deadline no problem, while thinking that it was actually going to be a very big problem: I already had a week-long family vacation planned during that time, and I had no prior knowledge of Iron Man beyond being able to pick him out in a costumed lineup. I stopped at a comic book shop somewhere in North Florida to buy the recent Iron Man trades and back issues, and read most of them in the car while my wife handled the rest of the driving. I wasn’t about to tell an editor willing to take a chance on me that I couldn’t hack it. Seeing the story now feels a little like peeking into a time capsule. I’ve scripted most of Flesh and Bone and three-quarters of The Lightning Thief since submitting “The Ark,” so a lot of pages were written in the interim. Sweet. I just messaged my nearest funny book shop and asked my pal there to snag me a copy. I’ve been reading Iron Man for, oh about 30 years. Of all the Marvel stuff, I always though it seemed like a good match for your style. I’ve always seen Iron Man as more sci-fi than super hero. At least in his own books. The Iron Man comics were more sci-fi and the Avengers were more punching and smashing.